The Quantum Atom Optics theory group at UQ currently has a number of PhD and other research students, and we are always interested in applications from bright, motivated students to join us. If you are interested, please read the following information to make sure that you are eligible to apply, before reading the information on these web pages about our research and specific PhD projects. Then contact the relevant staff member/prospective supervisor, sending a detailed CV including information about your grades from undergraduate coursework. For further general enquiries please email acqao-info physics.uq.edu.au. PhD information for domestic and international students: Completion of a PhD degree in Australia typically takes 3-4 years. UQ has recently changed its admission and scholarship applications procedure for domestic and international applicants to research higher degree programs. Applications will now be accepted at anytime throughout the year. Further information can be found here and here. While all aspects of enrolment and scholarship application are handled by the UQ Graduate School, it is essential that applicants contact a staff member from the Quantum Atom Optics group to discuss research projects in advance. Top up scholarships: Outstanding students who are successful in obtaining a scholarship for PhD studies at UQ will be offered an additional top-up scholarship of $6,000 per annum from our own funding resources. The top-up scholarship will be reviewed annually depending on student's performance. Australian IV Year Honours applicants: Information on the Physics Honours program can be found here. Summer Vacation applicants: These scholarship provide an opportunity for students to undertake a short-term but meaningful piece of research work, and will be of particular interest to students wishing to test their ability in a particular area of research and to inform their decision regarding possible honours studies. For further information, please contact one of the staff members in ACQAO. 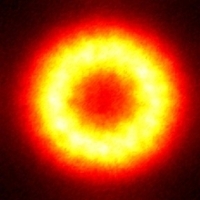 Quantum Atom Optics combines quantum optics with atom optics, the new science of ultra-cold atoms. Quantum Optics is the science of photon lasers, the most significant development in physics in the late twentieth century. It has led to countless applications, and is at the heart of modern communications and measurement. 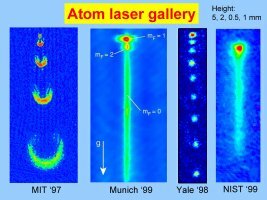 Atom Optics treats Bose-Einstein condensates (BEC) and atom lasers, where many atoms 'sing together' in a coherent matter wave. A field that is at the forefront of modern physics, ultra-cold atoms have been the topic of two recent Nobel prizes in physics (1997 and 2001). As well as being of importance to fundamental science, research into atom lasers has applications in nano-technology, gravity surveys and precision measurements. 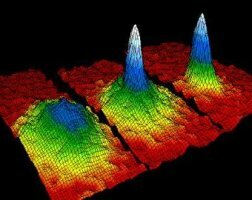 A Bose-Einstein condensate is a new state of matter predicted by Einstein over 70 years ago, but first seen only in 1995. 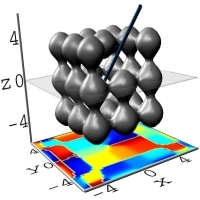 Bose condensates, which require ultra-cold temperatures (~100 nK) to form, exhibit quantum mechanical behaviour on a mesoscopic scale, and are providing exciting new insights into the fundamental nature of matter and matter-wave interactions. Research in quantum atom optics is aimed at understanding and utilising the physics of these exotic quantum systems, and UQ has a major theoretical programs in this area. The BEC and Quantum Optics theory group provides theoretical leadership to the ARC Centre of Excellence for Quantum-Atom Optics (ACQAO). Its pioneering work on 'super-chemistry' inspired experiments on atomic-molecular BECs internationally, and it is a world leader in developing computational techniques for dynamical quantum many-body systems. E. Cornell, in Special Issue on Bose-Einstein Condensation, Journal of Research of the National Institute of Standards and Technology, v. 101(4), p. 419 (1996). Link. Journal of Research of the National Institute of Standards and Technology, v. 101(4), (1996) Link. The Nobel Prize in Physics 2001 (Eric Cornell, Wolfgang Ketterle, and Carl Wieman): "for the achievement of Bose-Einstein condensation in dilute gases of alkali atoms, and for early fundamental studies of the properties of the condensates". Link. Advanced information on the Nobel Prize in Physics 2001. Link. E. A Cornell and C. E. Wieman., Rev. Mod. Phys. 74, 875-893 (2002). Link. W. Ketterle, Rev. Mod. Phys. 74, 1131 (2002). Link. 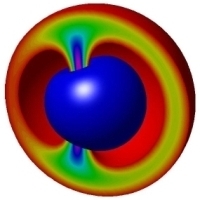 Nature Insight on Ultracold Matter (collection of review papers), Nature 418, 205 (2002). Link. "The physics of trapped dilute-gas Bose–Einstein condensates", A. S. Parkins and D. F. Walls, Physics Reports 303, 1 (1998). Link. "Bose-Einstein condensation in the alkali gases: Some fundamental concepts", A. J. Leggett, Rev. Mod. Phys. 73, 307 (2001). Link. "Theory of Bose-Einstein condensation in trapped gases", F. Dalfovo, S. Giorgini, L. P. Pitaevskii, and S. Stringari, Rev. Mod. Phys. 71, 463 (1999). Link. (also available at cond-mat/9806038). "Experiments in dilute atomic Bose-Einstein condensation", E. A. Cornell, J. R. Ensher and C. E. Wieman, in Bose-Einstein Condensation in Atomic Gases, Proceedings of the International School of Physics "Enrico Fermi" Course CXL (M. Inguscio, S. Stringari and C. E. Wieman, Eds., Italian Physical Society, 1999), pp. 15-66. (available at cond-mat/9903109). "Atom cooling, trapping, and quantum manipulation", Carl E. Wieman, David E. Pritchard, David J. Wineland, Rev. Mod. Phys. 71, S253–S262 (1999). Link. The field of Bose-Einstein condensation (BEC) is a significant, rapidly growing research area at the forefront of contemporary physics. Its attraction lies in its ability to display phenomena well known from other fields, such as condensed-matter physics, in a clear and unambiguous manner, allowing accurate and powerful theory to be applied to "real-life" experimentally relevant situations. Its significance was recognized with Nobel Prizes in Physics in 2001 for the first observation of BEC in 1995. BECs can be thought of a macroscopic number of particles sharing the same wave function, and the atoms have similar coherence properties to a laser. The development of the atom laser promises state-of-the-art measurement devices, but more fundamentally BECs allow us to model the quantum fields that underlie nearly all of modern physics in systems where we have unparalleled experimental control. Predicting the behaviour of these systems is a major theoretical challenge, and designing improved atomic sources is a critical requirement for future experiments. The discovery of Bose-Einstein condensation in 1995 by C. Wieman and E. Cornell, and the subsequent Nobel Prize awards in 2001, have introduced a new era in fundamental physics research. One of the outstanding opportunities in this new field is the theory and measurement of quantum correlations in ultra-cold atomic gases. These have applications to many areas, from novel tests of macroscopic quantum mechanics and quantum field theory, to determining fundamental quantum noise limits in atom lasers and precise engineering of novel condensed matter systems. This project is concerned with exploring the physics of the superfluid phase transition in strongly interacting Fermi gases and the study of dissociation of molecular Bose-Einstein condensates (BEC) as means of producing strongly correlated and entangled atomic ensembles. This is closely linked to an experimental program at the Swinburne University of Technology node of ACQAO on ultra-cold molecule formation using fermionic Lithium atoms near a magnetic Feshbach resonance. There are additional international links with experimental programs at École Normale Superiere (France), Innsbruck University (Austria), and Max Planck Institute for Quantum Optics (Germany). The simplicity and controllability of ultracold atomic experiments means that they are able to implement well-known models in many-body quantum physics and quantum field theory to a high accuracy. Examples include the well-known Bose and Fermi Hubbard models, which are realised by means of atoms in optical lattice potentials. These physically important models are fundamental to condensed matter physics and possess quantum phase transitions. Similar technology can also to implement reduced dimensional Bose and Fermi gases, where quantum correlation effects are important. Also, the equations for excitations in a BEC can be cast in the form of relativistic field equations, with a metric that corresponds to curved space-time. Thus BECs that can be used to study phenomenon analogous to black holes and Hawking radiation in systems that can be probed in the laboratory. Because dynamics and correlations can now be quantitatively studied in the laboratory, new questions are being put to these well-known models, in many cases demanding deeper theoretical understanding and new methods of solution. Recent pioneering experiments with ultracold atoms have opened up experimental regimes in which many-body quantum physics can be investigated with unprecedented simplicity and precision. Theoretical predictions can thus be tested to high accuracy. Although described by relatively simple models, except in special cases such systems cannot be solved analytically without serious approximations. The accurate simulation of quantum many body systems is one of the great challenges of many body physics. Fermionic simulations, plagued by infamous Fermi sign problem, are particularly difficult. Quantum phase-space methods are a proven way of simulating interacting quantum systems. 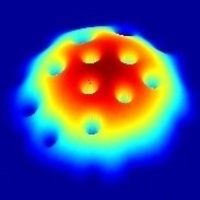 Originally developed to simulate optical systems, they are under development in the centre, by means of "stochastic gauges", alternative basis sets, and hybrid approaches, to tackle systems with stronger interactions (such as atoms) and to simulate fermions as well as bosons. ACQAO has a strong program in computational physics. The in-house simulation package for stochastic PDEs, known as XMDS, is useful for many projects in the centre, and its extension to new types of problems is an active area of development. 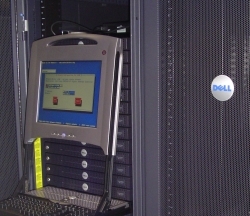 A new 64bit Linux cluster at the UQ node is available for researchers in the centre. A dilute atomic gas at temperatures close to absolute zero can form a new state of matter - the Bose-Einstein condensate (BEC). Its experimental creation in 1995 was recognised by the Nobel Prize award in 2001. In a condensate, a macroscopic number of particles share the same quantum state. Hence the collection of atoms can behave coherently, as a single giant "matter wave". A BEC loaded into periodic potentials created by interference of laser beams forms a perfectly ordered periodic "crystal", called an optical lattice. The dynamics of the coherent matter waves can then mimic the behavior of a single electron in a crystalline solid or a coherent wave of laser light in a periodic photonic structure ("photonic crystal"). The critical factors that make BECs in optical lattices remarkably different from both solid state and optical periodic structures are the inherent nonlinearity of the condensate due to atomic interactions and the tunability of the optical lattice potential. This project will examine the effects that arise due to the interplay of the BEC nonlinearity and periodicity of the optical lattice. This study aims for a deeper understanding of links between the physics of superfluidity, condensation, and nonlinear atom optics. Entanglement and the failure of local realism make quantum mechanics quite different from classical mechanics. This is at the heart of such phenomena as the Einstein-Podolsky-Rosen paradox and the Bell inequalities. Open questions include how entanglement can be extended to multiple observers, what happens with macroscopic particle numbers, and whether quantum superpositions are affected by gravity. Can we test quantum mechanics in new regimes, including macroscopic systems and/or massive particles? Potential applications are to precision measurements below the standard quantum limits.